Insulated Gloves » Protective Solutions, Inc. 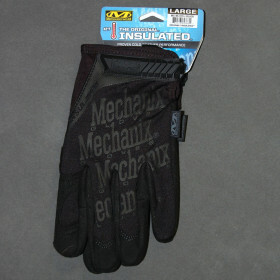 The Mechanix Wear Original® Insulated glove was created to lock in the warmth. A comfortable single layer of form-fitting fleece lines the entire glove, preserving warmth without sacrificing valuable dexterity. - Durable, water resistant coated fleece and liner keep hands dry.